Convert USB 3.0 Male to Female. Connectors: USB 3.0 Type A Female to USB 3.0 Type A Female. 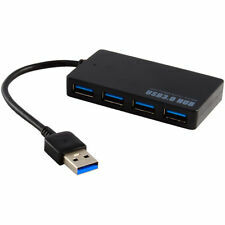 1 x USB 3.0 Female To Female Adapter. Compliant to USB interface Version 2.0/3.0. For mostly Printers, Scannner and other USB 3.0 devices. USB 3.0 transfer rates of up to 5Gbps Backward compatible with USB 2.0 Plug and play (no drivers needed) Dimensions: 7.6x4x1.1mm GL3520 Chipset This 4-port USB 3.0 hub offers a fast and simple connectivity solution for your computer with the most advanced USB standard currently available on the market. It is designed to achieve maximum throughput, whether its connected to a SuperSpeed USB 3.0 device with transfer rates of 5Gbps or a High Speed USB 2.0 device with rates of up to 480Mbps. USB Hub 3.0 powered With 15cm USB 3.0 Cable: flexible cable can extend the hard-to-reach USB ports on your desktop to your desired location, which making it a nice choice for desktop. easily to connect hub to expand OTG function for phone & Tablet. 1X USB 3.0 Cable. This can only delay our service. You will be pleasantly surprised by our service. This bus powered hub will support up to 900mA of current. - Each port has an individual power switch and a blue LED power indicator. - Each port has a power switch and LED power indicator. 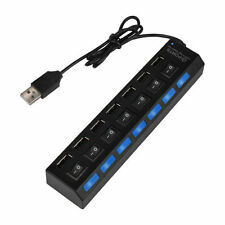 - SuperSpeed USB 3.0 ports to your computer with this 7-port hub. These particular USB 3.0 cables feature a Type A Male (Computer/Tablet/Laptop/Hub side) to Type A Female (Device side with Type A Female ended cable). Add to this the new support for a new interrupt driven protocol, the device can initiate the transfer, vs the old host based device polling. Input interface: RJ45 to network cable. Windows XP / Vista or Windows 7 or Windows 8 8.1 or Windows 10 or Macintosh OSX 10.6/10.7. 1 x Gigabit USB3.0 Ethernet Adapter. • Supports both full-duplex and half-duplex operation in Fast Ethernet. 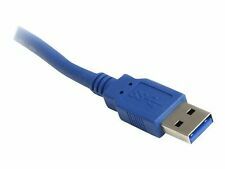 USB 3.0 transfer rates of up to 5Gbps Backward compatible with USB 2.0 Plug and play (no drivers needed) Dimensions: 7.6x4x1.1mm Includes 5V 2A (10W) Power Adapter GL3520 Chipset This powered 4-port USB 3.0 hub offers a fast and simple connectivity solution for your computer with the most advanced USB standard currently available on the market. It is designed to achieve maximum throughput, whether its connected to a SuperSpeed USB 3. Thunderbolt Cable cord 1M thunderbolt male to thunderbolt male in black color. this is a thunderbolt 2 cable(not compatible with thunderbolt 3 and mini dp). Use this cable to connect Thunderbolt-enabled devices to the Thunderbolt or Thunderbolt 2 port on your M-ac. 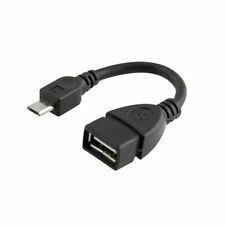 $Features ---USB 3.0 A EXTENSION: USB 3.0 Male to Male cable connects a USB peripheral with USB 3.0 type A port to a computer for speedy file transfer. It acts as an extension for your USB 3.0 connection. ---SUPER SPEED TRANSFER: Up to 5 Gbps SuperSpeed for USB 3.0 data transfer, 10x faster than USB 2.0. Backwards compatible with computer USB 2.0 and USB 1.1 ports - these cables also allow connection of USB 3.0 devices to legacy USB 2.0 computers. ---PLUG & PLAY: No driver needed for the usb 3.0 a to a cable. Just plug-and-play for hard drive enclosures, printers, modems, cameras, and other SuperSpeed USB peripherals. It acts as an extension for your USB 3.0 connection. Backwards compatible with computer USB 2.0 and USB 1.1 ports - these cables also allow connection of USB 3.0 devices to legacy USB 2.0 computers. 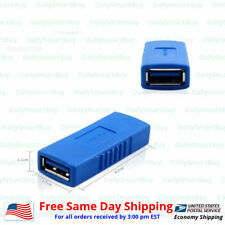 This USB 3.0 A Female to A Female Adapter can be used to connect two USB cables with male connectors. 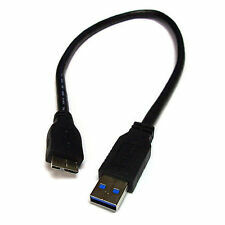 USB 3.0 A Female to A Female Adapter. Connector 1: USB 3.0 Type A Female. Connector 2: USB 3.0 Type A Female. Features: 1. two USB female can not data transfer together, can transfer one only. USB 2.0 Female is for power and data. Kindly note the two USB female can charging together, however the. 1 x USB Cable. Computer peripheral devices, such as keyboards, mice, printers, and other accessories, usually require some sort of data cable that conforms to a widely agreed upon industry standard. In everyday computing, the most common standard for data cables and connectors is the "Universal Serial Bus," also known by the initialism "USB." As part of the official USB specification standard, there are several different styles of connector cables, hubs, plugs, and ports designed specifically to accommodate several different classes of devices based on their particular size and power requirements. What is the purpose of USB hubs? Universal Serial Bus hubs allow multiple devices to connect to a single USB connector port. 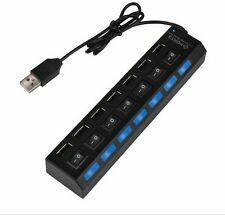 There are no fixed requirements on the number of slots a USB must have, but typically a hub will provide at least four or more additional connector ports. Desktop computers come with a handful of connection ports while laptop computers might have two to three available ports. For laptop users, if you like to use a normal mouse instead of the inbuilt touchpad, then a laptop with only two available connector ports will always have only one connector port free for other devices. Do USB hubs have any additional features? The Universal Serial Bus standard can handle the data needs of many devices connected to a single port. Unlike the data, however, there are limitations when it comes to using a single USB cable or connector port to power unpowered devices. Powered hubs have an additional power adapter that uses its own electrical outlet while unpowered hubs need only be connected to the computer. What are some common types of USB connectors and plugs? Type A plugs: These are the most common plug type available. Most USB cables will have a type A plug at one or both ends. Type B plugs: Printers are amongst the only devices that will use standard-size type B plugs, but for smaller sizes, type B plugs are used almost exclusively. Type C plugs: Only USB 3.0 cables and devices use this style of plug. Mini USB connector: The USB "mini" USB connector is smaller than the standard-size connector cable but still larger than the "micro" connector. These also have type A and B styles, but the type B style itself has two incompatible variations, the 4-pin and the 5-pin variant, so named for the number of pins they use. Micro USB connector: Of the major connector cable styles, the "micro" is the smallest. In addition to the type A and B versions, the micro USB connector also has a 3.0 variant that is backwards compatible with micro 2.0. What's the difference between USB 2.0 and USB 3.0? The 2.0 and 3.0 numbers refer to the version or generation of the general Universal Serial Bus specifications, but despite this difference, all USB devices are required to function with either the USB 2.0 or USB 3.0 connector ports. There are, however, some additional benefits to version 3.0, such as increases to both the power throughput and data transfer speed, but in order for a device to take advantage of these features, both the connector port and USB cable must be designed for version 3.0 operation. If either the connector port or USB cable are designed for only version 2.0, then the device will operate at only version 2.0 power levels and data transfer speeds.